Built in 1904 by renowned architect Charles Platt and originally the home to Clifford & Alice Cheney, the mansion is now registered as a national historic landmark. 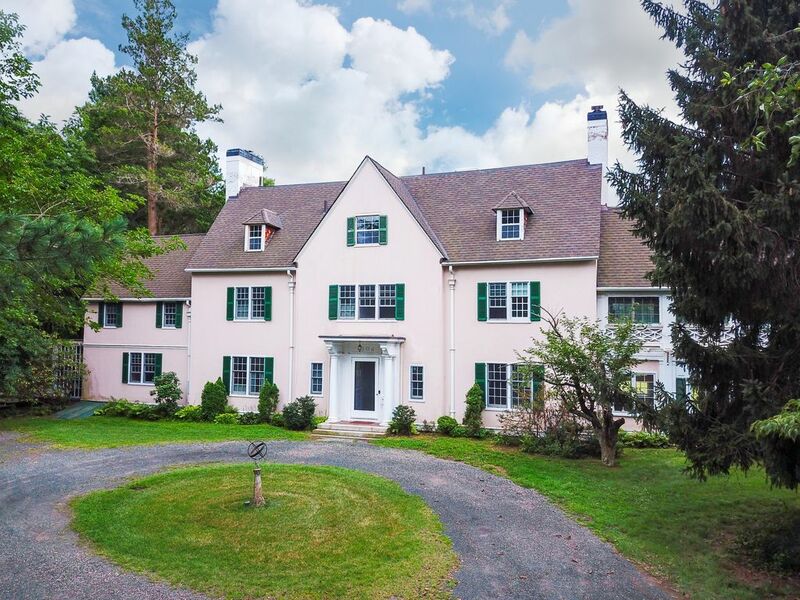 Located only 15 minutes from Hartford but feels like a world away, all of the Cheney mansions occupy 70 acres along Hartford Rd and each mansion is situated in a park like setting. At the Clifford Cheney mansion you will enjoy the expansive views of the Great Lawn from every South facing window. The house is well equipped for all of your needs whether you are looking to book the home for a quick getaway or host a variety of events such as a family reunion, corporate event, bridal/baby shower, rehearsal dinner, small reception, memorial service, holiday party, fundraiser or wellness/yoga retreat. Upon entering you will be greeted by a large foyer with original french doors that lead to the one store columned portico overlooking the South lawn. The mansion features a large kitchen with a commercial range and large island with a prep sink. Formal dining room with entryways from the butler pantry and main foyer. Relax and unwind in the formal living room adorned with books and a large fireplace or step into the media living room to indulge in a little TV (smart TV with a access to Netflix, Amazon, HBO and basic cable). Retreat to the second story to one of the six bedrooms. Two oversized master bedrooms with king size beds, one has an ensuite bath. Two bathrooms in the hallway that lead to a bedroom with two twin beds and two additional bedrooms in the “servant” quarters, one with a queen size bed and the other has a full size bed. The sixth bedroom is available during the summer, located off of the master closet, features a green ceiling and eclectic decor. Third story features two extra twin size beds, casual living area, pool table, 7th bedroom and with a king size bed and a 4th bathroom. We are a couple that has their primary home in Fort Lauderdale, FL but we both grew up in New England. I am a real estate broker and Attila is the owner of a home a/v company in Miami. We have a passion for renovating and designing properties. This is our second vacation home (the other is in Jensen Beach, FL) and we have truly enjoyed interacting with each guests that rents from us. We have a traveled to 36 countries and we always prefer to renting property from individual owners vs. hotel/resorts. Each home gives us a unique perspective on the city we are traveling to allowing us to embrace the culture in a way that we never could staying at a corporate hotel. We hope you feel the same when you rent our vacation home. Where do we start? The Clifford Cheney mansion is such a unique property. We are intrigued by the history of the Manchester and the role the Cheney family played a huge role in developing the city to what it is today. This mansion in particular peaked our interest because it was designed by renowned architect, Charles Platt. You will notice some of Platt's signature designs throughout the house from the herringbone designed wood floors, mahogany walls, tall ceilings and how each main living space is positioned perfectly to overlook the South lawn (Great Lawn). A/C is located in 4 bedrooms in the second floor and the family room. Please only use A/C with the doors shut. This was a great place for out of town family to stay for our daughter's wedding. The house is in a great location. The setting is quiet and feels secluded but is close to restaurants, shopping and major roads. The house has a good mix of old and modern. The furnishings have an antique feel but are in good condition. The beds were in excellent condition. The kitchen seemed to have sufficient supplies. Although we only used it to make light breakfast, coffee and snacks. We chose not to cook or use the gas stove. The restaurant recommendations were very helpful. For an older house the bathrooms were sufficient. And overall the heat, electricity, plumbing all worked fine. The owner was responsive and communicated well. She worked with us for a couple special requests we made beforehand. And she worked to resolve a minor issue during our stay. We are so glad our out-of-town family could stay in one large home instead of hotel rooms. It was perfect wedding accommodations. Great location for a family gathering! We stayed at the Cheney Mansion for a long weekend to celebrate my son's graduation from Uconn. It was the perfect location for family and friends to gather. We only had 6 people staying in the house so there were extra beds to choose from! We really enjoyed the kitchen, the Solarium and the Sono speakers! We stayed in for almost all of our meals because it was so fun to hang out in the kitchen and to eat in the dining room. The Solarium was another regular hangout place. My kids loved the Sono speakers system! We frequently had music playing. In the evening we enjoyed cards or dominoes on the dining room table. We were in the house over Christmas so I really appreciate the Christmas tree and other decorations. It was chilly out so we only played on the beautiful grassy yard one time. It's a great area for ball games. We walked out to Main Street twice. It is close and has shops and restaurants. We had no problems! The house was perfect and the owner was very easy to deal with. Had a great stay in a very historic mansion in Manchester. The owner Christina was very helpful and very easy to communicate with. If you are looking to go back in time in a beautiful area this is it. It was all that the ads promised! A perfect setting for a family of 7, who live in three different states, to get together for a mini-vacation! This beautiful Cheney mansion was the backdrop for a large family gathering and we found it fit us perfectly. Offering a calm oasis on the Great Lawn we were only a block off Main St. restaurants offering wonderful and diverse fare. It's spacious main floor spaces easily accommodated our gathering of nearly 20 (only 7 of us stayed overnight) the 3rd floor billiards attracted the young adults but the portico pictured here was our mainstay - offering expansive views of the Great Lawn and constant cooling breezes.The house is not perfect (only 4 of the 7 bedrooms are air-conditioned) as it's still being updated - but definitely worth a visit. The owners are very responsive to any of your needs. Home was perfect for us to stay in while visiting for a wedding. Rates are subject to change until reservation is confirmed. Pet fee is per pet.